I finished up Block Five earlier this week and got started on Block Two right away. I'm getting so excited because I have just about two and a half blocks to go now! You'll have to excuse the wrinkles. I didn't iron today. I got the frame from Shakespeare's Peddler during the week also. I haven't taken it out of the box though. I'm going to wait until I get CaHRH finished. That is my motivation to get it done!! When I ordered the frame I couldn't resist getting a couple things. The first is Theresa's 1st Make-Do kit. I thought it was so sweet! I also got her kit of the month (for January). It's Little by Little "Brick House Sampler." I love the colors in this design. I think they're so pretty! Well, I didn't make it to Amy's last week because I caught a cold. So I plan to go tomorrow instead (now that I'm feeling better). I can't wait - I really need to get away! :) Write soon! I love the Christmas. It is really beautiful. Great Job! Hope to see the finish soon. Your CaHRH is just beautiful. You must be enjoying it so much. The colours are very vibrant. Love that Brick House Sampler! I love the latest blocks of CaHRH. And I'd been looking at the Little by Little chart on SP. Now I really want to get it too, although I wound up ordering Little by Little's Bo Peep, so I will probably wait. Every time I see your CaHRH I just catch my breath. So beautiful!!!!!! And yes, I succumbed on Theresa's make do as well. So cute! 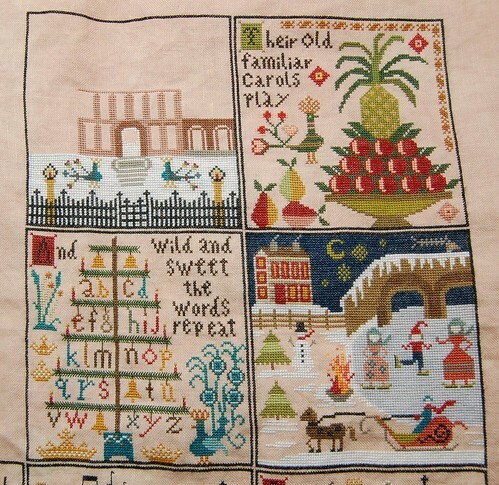 I have the Brick House Sampler but haven't stitched it yet or even kitted it up. I do love it -- those colors sitting there just make me want to get mine kitted too! Nicole, CAHR is just an amazingly beautiful piece! It looks like you are really enjoying this one. I picked up those same two from Theresa - can't wait to start on them both. Hope you and Amy have a wonderful day tomorrow. Your CaHRH is going to be STUNNING when it's finished. Good for you for sticking with it. It's going to look fabulous hanging on your wall next year. Like the other patterns as well. 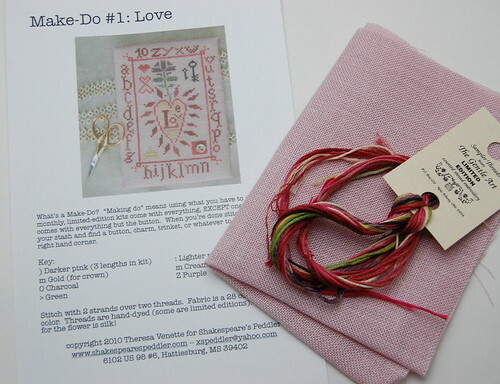 Theresa's make-do kit is cute, cute, cute! And I have to agree with you regarding those colors in the Little by Little Design. You're really flying through CaHRH Nicole, it's looking fantastic! Love your new stash too, the colours in the LBL design are beautiful! Nicole, you amaze me! You are just zooming along on this. I bet you'll have it finished in time to start AiHRH! Great new stash, too. You are such an inspiration! CaHRH is gorgeous. You'll be done and popping it in the frame in not time and we'll all be so jealous (uh, I mean) happy for you!!! Your new stash is beautiful - I really love the brick house sampler. Nicole, I just can't believe how quickly you're getting through Christmas. I love seeing all your updates! The colors on this piece are so nice and vibrant. And great stash haul too. There is nothing better than new stash, is there? That block is beautiful! I love the colors. I was just thinking/wondering if there is anyone out there that has stitched all the Hawk Run Hollows to date? That would be some collection! CaHRH is gorgeous and moving along a lightning speed. I'm wild for your new acquisitions, so I may have to make a little stop over there. Darn you! Yeah, I'm so glad you got that gorgeous frame. Great new stash too! Block 5 is complete awesomeness!! I love the fancy peacock, and, well, everything else!! 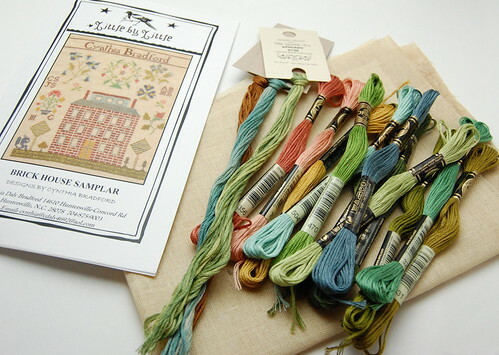 :D The "Sampler tree" is a hoot. I'm also nuts for that "Love" project, and I love the floss colours "lounging" on your pic of the third one! I don't know much of SP, other than Jenny Bean Christmas which I bought recently. Cute new stash and I love the CaHRH! Lovely work on your CaHRH. I see so many people working on Kathy's designs I feel like pulling one of my UFOs out as well. And your new kits are nice as well. It's too tempting when I go blog surfing! Gorgeous progress. Love your new stash. 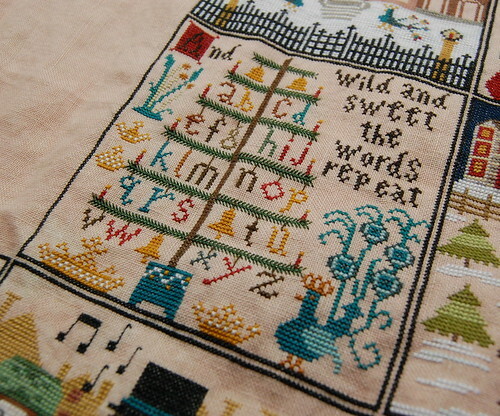 I have been cross stitching for many years, but have just recently discovered these wonderful cross stitch blogs. I'm slowly figuring out the abbreviations everyone uses, but haven't yet figured out how to determine the identity of WIPs - and I HAVE TO know what your CaHRH is. Please let me know, so I can add it to my "have to make this!" list. Thank you so much. 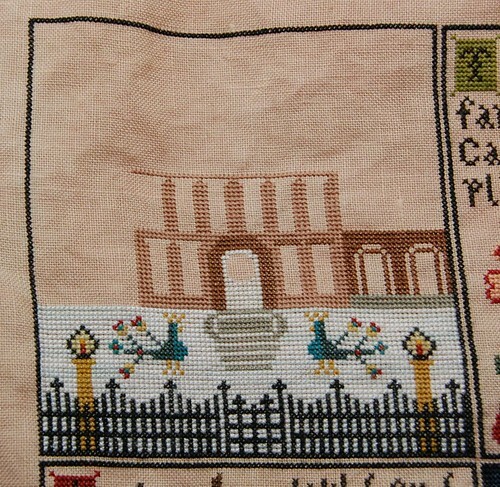 Debbie linked me to your blog to come and see your CaHRH as I'm thinking of stitching it. It's absolutely beautiful - as is all of your stitching...plenty for me to put on my very long wish list now, lol! Christmas at Hawk Run Hollow is Finished!! Ten Down, Two to Go!